The following diagram shows how to construct a parallel line through a given point. Scroll down the page for more examples and solutions. How to Construct a Parallel Line Through a Given Point? Constructing parallel lines with a compass and straightedge uses the converse of the parallel lines theorem. Creating congruent corresponding angles (or congruent AIA or AEA) guarantees parallel lines. Step 1: Draw a transversal through the given point to intersect the given line. Step 2: Duplicate an angle created by the transversal and the given line. 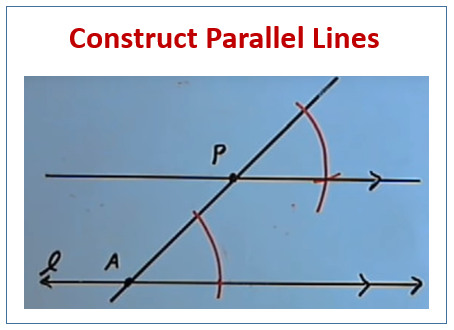 Construct parallel lines using compass and straightedge, given a line and a point not on that line.